Minnesota's top leaders were busy Thursday, spinning the outcome of the legislative session that ended Wednesday night. Republican Gov. Tim Pawlenty, along with GOP and Democratic legislative leaders, held a barrage of separate news conferences throughout the state. In keeping with the spirit of division at the Capitol this year, Republicans and Democrats have competing versions of what happened. St. Paul, Minn. — Although worn out from days of marathon negotiating sessions, key lawmakers did not mark the end of the special session with a break. Instead, the governor and three top legislative leaders traveled separately across the state to get their messages out. In Rochester, DFL Senate Majority Leader Dean Johnson said Democrats won from Republicans a better package than what had been on the table before a one-week partial government shutdown. "Had we folded our tent and gone home, 22,000 people in Minnesota would have lost their health care -- 22,000 people were saved on MinnesotaCare because we stayed and we fought for people to receive a Chevrolet plan of health care," said Johnson. "LGA in the governor's budget had a zero increase. Now there's $48 million worth of local government aid spread throughout the state of Minnesota ... simply to assist local governments to hold down property taxes. And in many cases they will be able to hire back police officers and firefighters. It's a matter of public safety," Johnson said. Johnson said legislators need to be humble about their performance -- or lack thereof. He said he hopes that eventually, voters will focus on what was accomplished. "The end product is more important than the actual process. Once the people of the state start to look overall at the products and public policy changes of this legislative session, they will say OK," said Johnson. Johnson did say he is disappointed that Gov. Pawlenty vetoed a major transportation bill, and that a corporate tax law was never adopted. Johnson also blames the governor for the protracted special session, and much to the governor's dismay, has labeled Pawlenty "Governor Shutdown." "Senator Johnson -- it would be in his best interest to be constructive and be positive, and try to represent the people of the state," responded Pawlenty. "I don't think people want to see more fingerpointing and bickering." Gov. 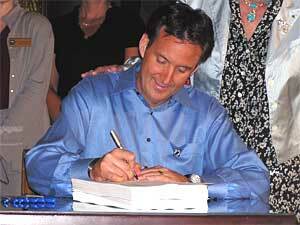 Pawlenty signed the four remaining budget bills, and cited the education bill as one of several major legislative accomplishments. Pawlenty told reporters he won 12 of the 14 initiatives he laid out in his state of the state speech in January, without excessive spending increases. I think this governor made too many pledges to special interest groups. "Government is going to grow. Government does important things. We just want it to grow within reason and grow at a rate that's sustainable," said Pawlenty. "We had in the November forecast, revenues that were increasing about 8 percent for the upcoming biennium, and we wanted the state to live within about that level of spending increase. This budget package does just that." Republican House Speaker Steve Sviggum also traveled the state, accusing Democrats of forcing the shutdown to make Pawlenty look bad. DFL House Minority Leader Matt Entenza leveled the blame on Republicans, and the "no new tax" pledge the governor is now accused of breaking, by proposing and ultimately signing a 75-cents-per-pack increase in the cigarette tax. The increase is called a health impact fee in the budget. "That's why we get stuck. We get stuck when politicians dig in," said Entenza. "They won't compromise, they won't reach to the middle. At the end of the day, as Democrats, we comprised." This was Minnesota's first partial government shutdown, but it by no means was the first time the Legislature had to go into a special session to get a budget deal. University of Minnesota, Duluth political science professor Craig Grau says gridlock at the Legislature last year very likely led to the defeat of some Republican House members in the November 2004 election. He says it's unclear how voters, angry with lawmakers now, will feel about the Legislature and governor in November 2006. Grau says lawmakers need to figure out what's preventing them from cooperating. "Couldn't this have occurred two months ago -- this same deal? Couldn't they have reached this two months ago, and if not, why not? And then if we find that answer out, can that be fixed?" Grau asks. "Is it too much partisanship, is it that the structure of the system that's part of the problem? I think it's probably the former," says Grau. "I think they've become too partisan, which is reflected again in the two parties giving their spin today." Already there is talk about another special session, possibly to deal with stadium, transportation and environmental issues. The governor says he's open to the idea, but that he would not call lawmakers back a second time without first reaching the framework of an agreement with legislative leaders.